Cheri, a current customer of BsnTech, asked us about creating another website for her a few weeks back. She was gathering the details for how she wanted the site to look and her idea for the site. Last week she was ready to proceed with the site. She provided mock-ups of how she wanted the site to look along with the photo she wanted on the home page. The main theme behind the site is simply a blogging site where she can post materials – but also allow users to subscribe and receive a guide as well. The website was approved and completed late last night and it is ready for visitors! 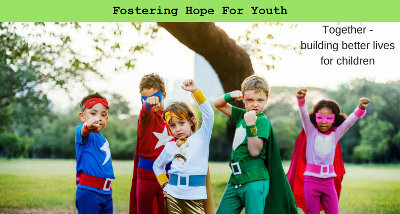 Fostering Hope for Youth can be found at fosteringhopeforyouth.com. Catherine contacted us last week and needed some help on her website. 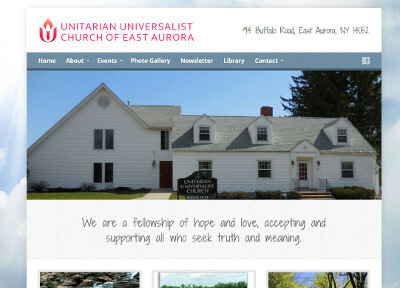 Catherine is serving her church by managing and maintaining their website for Unitarian Universalist Church of East Aurora. We contacted Catherine Friday evening. She had a list of items put together that she needed some help with. We used our remote session software to login to her computer while on the phone and provide consulting and training for her WordPress website. Some of the items she needed help with was to remove an item from her main menu navigation, adding pictures to her newsletter pages from a PDF newsletter, uploading pictures to her gallery, and naming photos in the gallery. We were able to complete the training and provide her written documentation of the conversation within an hour’s period of time. We appreciate Catherine reaching out to us and she now has someone she to call when there are other questions about her site! Their website is at uuea.org. Hal contacted us last week. He makes special creations with wire – such as jewelry and an assortment of personalized wire bikes for decorations. 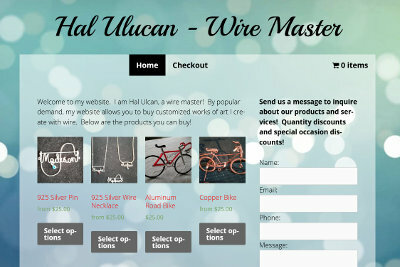 He informed us that many of his customers have always asked if he had a website so they could purchase his items online. That is why he reached out to us. Hal wanted to be able to have a website where customers could purchase and personalize. He would create the items and then ship them to the customers. Hal sent us all of the information for each of the products along with options for each. We created his simple eCommerce website design along with mobile device compatibility and a basic contact form for inquiries. In just two days, the site was setup and approved! Hal’s website is at personalizedwire.com. Billy, the owner of Voodoo Engraving, reached out to us a few months ago. He had created a website himself but wasn’t happy with how it looked. Therefore, he wanted us to create a new website. The main theme of his site is New Orleans and “voodoo” – which goes along with his story on how he decided to name his business. He provides a wide range of engraving services at very low pricing. We created the website fairly quickly upon the initial payment, but Billy let us know he wasn’t completely happy with the work at that point. He re-grouped and a few weeks ago to provide additional guidance. Initially when we made the site, we put the picture gallery on the homepage so everything was available to the customer right away. Instead, we split the gallery up until a few different pages so each gallery was specific to the type of engraving that he has provided. The website is now completed and approved! 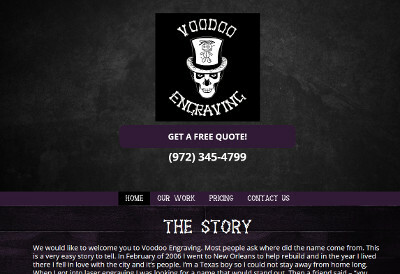 The site for Voodoo Engraving is at voodooengraving.com. Curtis contacted us a couple of weeks ago asking about our logo design service. We provided the two options we have available and provided him our questionnaire to start on a logo design. Once this was returned to us, we got started with the logo design. Our designer created several completely different mock-ups of logo designs based on the request from Curtis. This caused the process to take longer than it usually does. However, we completed the logo and satisfied their logo design need. We appreciate the business from Curtis and hope we can help him with other services in the future! David from Point 3 Realty contacted us late last night. He was looking for some help on his current website. 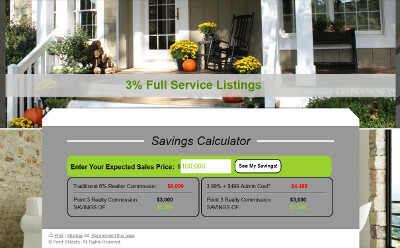 A new feature was requested to be created – one that would calculate the commission savings from a Realtors, discount brokers, and his pricing. Once we provided David with the costs, he let us know the next day (today) that he wanted to hire us to get the work completed. We started work on it in the afternoon and went through a few modifications. By 4:30, the calculator was completed and working on the website. We appreciate the business from David! His website is at point3realty.com. Cal emailed us late on Friday evening. He needed some website help. Several years ago, he created a website for his second home – a cabin in Michigan. Somehow, the website got shut down / removed at Google. He had all of the backup files stored on his computer but didn’t know how to get them re-published again. So, he setup a website builder account with another hosting provider but was not happy with how the pages looked and the amount of work it required to make any changes. BsnTech Networks stepped in right away and helped Cal with his issue. That same night – Cal sent us over the zip file of the website files. He provided us the hosting login information and we had the website builder stuff removed and had his original / older website up and running. All within an hour! Cal was very happy with our quick response and will do business with us again in the future for any other website needs he may have. 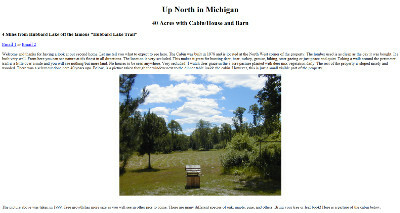 The website address for Cal’s site is at hubbardlakecabin.com. Skip, the owner of Creative Structures, LLC – reached out to us last week about our website design service. 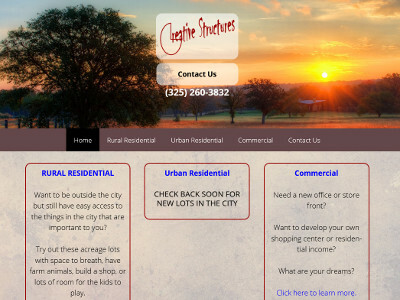 He needed to get a simple website created for his land and development business in the Abilene, TX area. His needs were very basic with only the creation of a few pages, a contact form, and ensuring the site was mobile friendly. Upon receiving the initial amount to start, we began on the site right away. Skip also requested that we setup just the layout/design of the site and he would add the material in himself – this way it would also give him some practice on managing the website as well. We checked in with Skip today and he said everything was ready and approved. We hope that we’ve exceeded Skip’s expectations to win the business for his non-profit organization as well. The website for Creative Structures, LLC is at creativestructures.net.